The so-called "Big Three" — Republicans Gov. Greg Abbott, Lt. Gov. 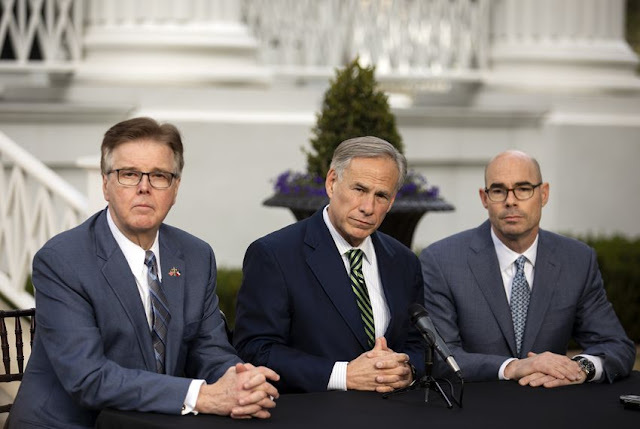 Dan Patrick and newly elected House Speaker Dennis Bonnen — punctuated the effort Wednesday morning with a joint news conference outside the Governor's Mansion, where they swore to be in lockstep on an ambitious list of priorities for the session, including reforming school finance and property taxes. "We are here today to send a very strong, profound and unequivocal message — that the governor, lieutenant governor and speaker are working in collaboration together on a very bold agenda that will be transformative for the state of Texas," Abbott said. The news conference came a day after the session began with Bonnen's unanimous election as speaker, replacing Joe Straus, a San Antonio Republican who retired. Last session, there were persistent tensions between Straus and Patrick. Patrick used the news conference to emphasize what can happen when the three officials are all on the same page. "If the three of us are aligned that we're going to accomplish a mission and pass legislation, it happens," Patrick said. "And if the three of us are aligned that something isn't going to pass, it doesn't happen. So this is not just a message to the public and to the media, but I think our members will take note that this is really unprecedented that we're addressing the issues beginning of session, totally united with one another." Among the issues that caused leadership headaches last session was the Patrick-championed "bathroom bill" that would have regulated which restrooms transgender people can use. Asked at the news conference about the proposal potentially coming up again — Straus had been its biggest obstacle — Patrick sought to put it in the past, reiterating comments he has previously made about winning public opinion on the issue even if the legislation did not pass. Throughout Wednesday, Patrick expressed optimism about the Bonnen speakership. Addressing the Texas Realtors Association later Wednesday morning, Patrick said he will be having dinner with Bonnen, describing it as a "new experience with me for a speaker." The two will not always agree, Patrick said, "but when we disagree, we're gonna do it professionally, and it's not gonna be on the front page." "I'm more relaxed this session around because I feel like I have a partner on the other side I can work with," Patrick said. Patrick missed the first day of session Tuesday for a trip to Washington, D.C., where he helped the White House work on President Donald Trump's primetime address to the nation on border security. Patrick said it was a "very late ask and it was a tough judgment call, but when the White House calls, you respond." "I'm not going anywhere," Patrick said, apparently alluding to speculation that he was in the mix for a Trump administration position. "I'm the lieutenant governor of Texas as long as I can be." Patrick was more emphatic later Wednesday morning while speaking to real estate agents, saying he has "not been offered a job [in the Trump administration], I'm not gonna take a job, I'm not interested in taking a job." "Just end the rumor," Patrick said. "It's crazy. It's out of control."